Instead of a regular Sunday Service, we're going to spend the morning packing shoe boxes full of gifts to be sent to children around the globe. But we need your help. We need you to donate the gifts. So, go shopping and bring your gifts to church on that Sunday and we'll all pack shoe boxes together. NON-LIQUID HYGIENE ITEMS: Toothbrushes, soap, combs, washcloths, etc. CRAFTS: Make your own items such as hair bows, finger puppets, and friendship bracelets. Check out inspiration on Pinterest. DO NOT INCLUDE: Candy; toothpaste; used or damaged items; war-related items such as toy guns, knives, or military figures; chocolate or food; seeds; fruit rolls or other fruit snacks; drink mixes (powdered or liquid); liquids or lotions; medications or vitamins; breakable items such as snow globes or glass containers; aerosol cans. 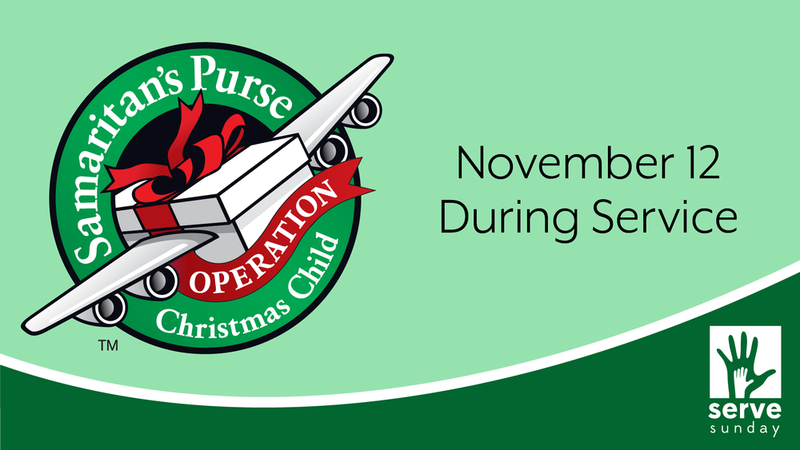 Visit the Operation Christmas Child website for more details on how to pack a shoe box, video tutorials, and powerful stories of children's lives impacted by God's love.